The pattern is lovely, giving a thick, textured fabric. 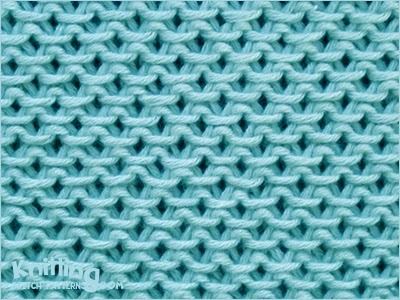 This stitch is based on garter stitch, so there's no purling and it doesn't curl up. You may slip the stitches knitwise or purlwise, as long as you keep the yarn behind your fabris while you are working. Slipping knitwise which twists the stitches when you knit them on the next row, will make a slightly tighter, denser fabric. Row 2: Knit 1, * slip 1, knit 1; repeat from * to end. Row 4: Knit 2, * slip 1, knit 1; repeat from * to last st, knit1.